Just as a company doesn’t just have one department which receives traditional mail, your service desk will also serve multiple teams. Each team can have its physical email mailbox. 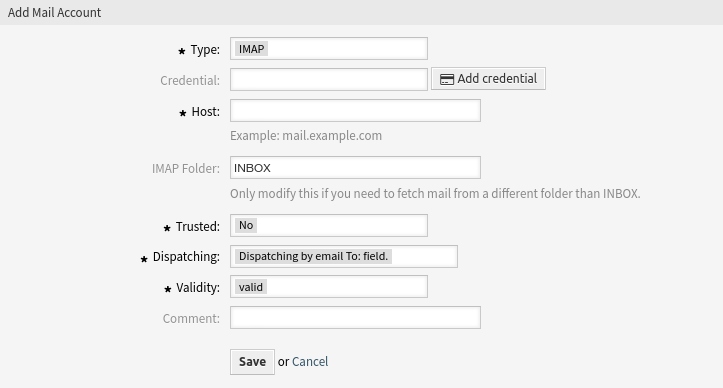 OTRS eases setup for email mailboxes. OTRS manages polling one or multiple email mailboxes of any internet standard type. Use this screen to add mail accounts to the system. The mail account management screen is available in the PostMaster Mail Accounts module of the Communication & Notifications group. 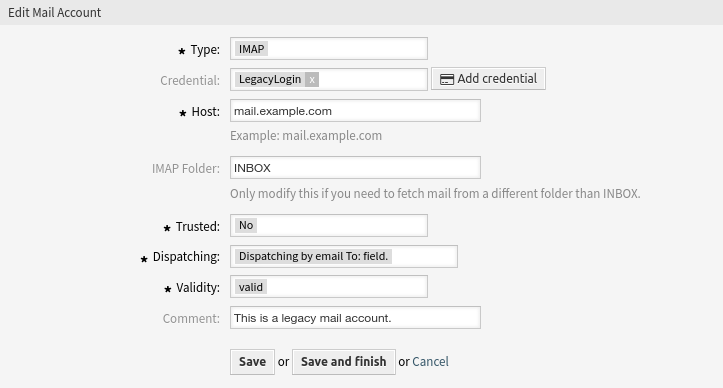 When fetching mail, OTRS deletes the mail from the POP or IMAP server. There is no option to also keep a copy on the server. If you want to retain a copy on the server, you should create forwarding rules on your mail server. Please consult your mail server documentation for details. If you choose IMAP, you can specify a folder for collection. Selective dispatching of mails is then possible. All data for the mail accounts are saved in the OTRS database. The bin/otrs.Console.pl Maint::PostMaster::MailAccountFetch command uses the settings in the database and fetches the mail. You can execute it manually to check if all your mail settings are working properly. On a default installation, the mail is fetched every 10 minutes when the OTRS daemon is running. Click on the Add Mail Account button in the left sidebar. Click on a mail account in the list of mail accounts. Click on the trash icon in the list of mail accounts. If several mail accounts are added to the system, a filter box is useful to find a particular mail account by just typing to filter. The username of the mail account. The password of the mail account. The folder in the mail account to be fetched. Other folders remain untouched. If Yes is selected, any X-OTRS headers attached to an incoming message are evaluated and executed. Because the X-OTRS header can execute some actions in the ticket system, you should set this option to Yes only for known senders. The X-OTRS headers are explained in the filter conditions of Postmaster Filters. The distribution of incoming messages can be controlled if they need to be sorted by queue or by the content of the To: field. The system checks if a queue is linked with the address in the To: field of the incoming mail. You can link an address to a queue in the Email Addresses screen. If the address in the To: field is linked with a queue, the new message will be sorted into the linked queue. If no link is found between the address in the To: field and any queue, then the message flows into the Raw queue in the system, which is the postmaster default queue after a default installation. The postmaster default queue can be changed in system configuration setting PostmasterDefaultQueue. All incoming messages will be sorted into the specified queue. The address where the mail was sent to is disregarded in this case.